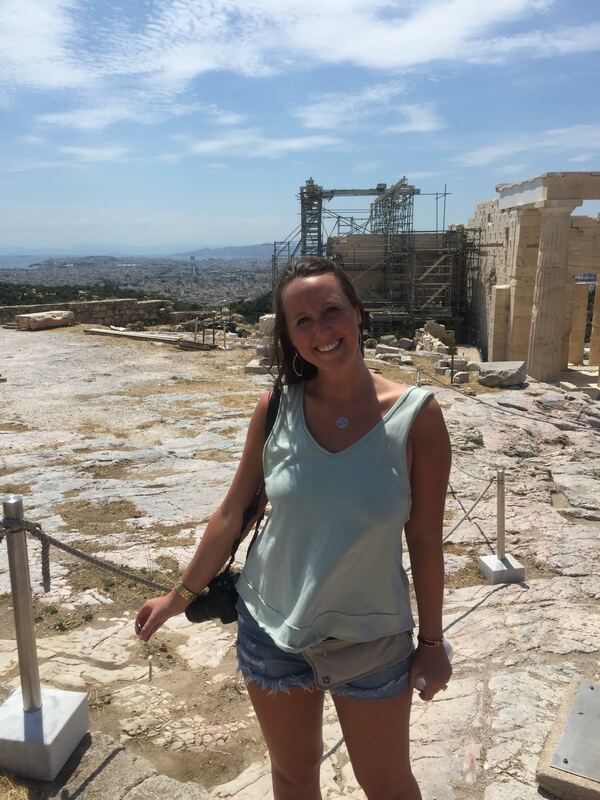 Meggie Carter, a senior at the University of Mississippi, is embracing the Greek way of life 100%. We can’t wait to hear more! As my first week in Greece has almost wrapped up, I have reflected a lot on how I feel this far. Traveling through 4 time zones in 7 days (Mississippi-Connecticut-Munich-Athens) I feel it has been a complete whirlwind. I arrived feeling completely exhausted and overwhelmed not sure what direction to take. I decided my first order of business was try to disconnect from the U.S. type of schedule and just immerse myself into the Grecian way hoping the rest would fall into place. I did just that. I feel in order to try to be in touch with the culture here, it has been necessary to leave my quick, fast paced American way of doing things behind. My iPhone has been either not on me or off in my bag except for the hotel lobby where our wifi is! At restaurants, instead of eating, I have been dining. I don’t rush for the check but have a few last bites, tell another story, get another glimpse of the view or start a new conversation with a student I haven’t met yet. My concerns of everything at home have fallen by the wayside and I have connected myself with the amazing, wonderful girls (and 3 boys!) here on the trip. Coming from a very fast paced life I live in the US, I have had to force myself to calm down, be more patient (as my father has always persisted that I try better to be) and truly take in every single moment. Where, at home I have a lot of trouble relaxing, I have found incredible relaxation here. The Greek people are in no rush to do anything, have the warmest of smiles and are incredibly kind. I feel myself, while not understanding the language at all, taking almost like a long awaited break I have been needing. Not knowing more than 2 words in Greek, I feel almost more comfortable because I feel invisible here. I’m not a part of anything that has a connection to home (except the Go Global group), so that I feel I can truly take in what they are doing and the Grecian life here. Being from a hometown and now college town where I know everyone and vice versa, there is a real sense of disengagement that has led me to relax unlike any time before. My mind isn’t constantly bursting with needing to do certain assignments, errands or work related things. All I am concerned with is making the most of my experience, seeing as much as I can and immersing myself as much as possible.